Customisable Manchester United FC training top. 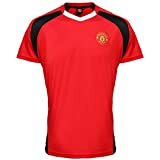 This entry was posted in Soccer and tagged CUSTOM, Custommade, Football, Manchester, Official, Shirt, United by FPSports. Bookmark the permalink.